In the below March 7, 2010 interview with Metro News, British actor Ben Whishaw reveales he's borrowed Joni's lyrics. 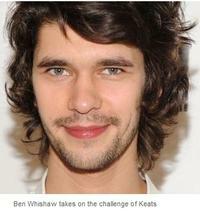 Whishaw 29, made his name as the young Hamlet in Trevor Nunn's 2004 Old Vic production. He's since appeared in films including Perfume, Bob Dylan biopic I'm Not There and a recent Brideshead Revisited remake. He plays Keats in Bright Star, out on DVD today. Most of your roles have been intense, sensitive or traumatised characters. Does that say something about you? I can see that a little bit, yeah (laughs). I suspect it does but I don't feel I could say exactly what. I'd love to do a comedy, something totally different from anything I've done before. Could you see yourself playing a tough cop, an action hero...? No, not really at the moment. You could buff up. I could try. I have tried to buff up but it's not something that comes naturally to my body type. I must have the fastest metabolism, because whatever I eat it doesn't go anywhere. Hollywood snaps up a lot of young British acting talent. Have you turned down many offers? I haven't said no to Hollywood offers that I can recall. There haven't really been any. I'm more interested in films that are about people and the way people live and relate to each other because that's what interests me about life, rather than in special effects. That's not to say that one day it wouldn't be fun and refreshing to do that. I'm open to everything. What was it about Keats that made you interested in playing him? He was a great artist and poet, someone who achieved staggering amounts by the age of 25, which is when he died. It was interesting for me to get into the mindset of someone who lived life that intensely and achieved more than many people achieve in a lifetime. What is your perception of him? There's an image that's been handed down of him as limp and oversensitive, and that his bad reviews killed him off, but when you read his letters and read what other people said about him, you realise that actually that wasn't the case. He was a very sensitive guy, someone who had strong feelings, but he also had an amazing robustness, strength and tenacity, and that combination of strength and sensitivity is rare. Do you have a favourite poem of his? I like Ode To A Nightingale, a great poem where he talks about being stuck on the Earth listening to a bird while the bird flies around singing its song in ecstasy. The line I like is: 'Thou art pouring forth thy soul abroad in such an ecstasy.' The way I take it, it means we should all pour forth our souls in ecstasy — we should just be ourselves and sing our songs. Have you ever used poetry in your love letters? I can't write poetry. I've written love letters, but poetry has never come naturally to me. I was never particularly good with words, and I'm still not especially. My form of self-expression as a teenager was always painting. That's what I loved in school. I think I've put the lyrics from a Joni Mitchell love song in one of my letters before, but never any poetry. You're about to play a sprite in a big screen version of Shakespeare's The Tempest. How do you go about playing a sprite? You go about it by shaving all the hair off your body, including your eyebrows, then covering yourself in white paint. Hamlet was your breakthrough role. Is it good to be back working on Shakespeare again? I do enjoy Shakespeare. I love it actually. But I think we're in danger sometimes in this country of just doing it because he's a part of our heritage, not because we actually want to do his plays, and that can result in some stuffy productions. That's not good for theatre or Shakespeare. But I do love it. Who is the better poet — Keats or Shakespeare? Oh, good lord. I'm no expert but I personally prefer reading Keats. I guess I'm biased at the moment.